White like sheep, but some are wolves in sheep clothing. While we watch the video clips that mock and make fun of Alexandria Ocasio-Cortez, we inadvertently fail to watch her full interviews or press conferences; therefore, we fail to hear what she is stressing to her followers. We also fail to notice who is promoting her agenda. There is a large number of Americans who have fallen for the Climate Change scam and they fully support the "Green New Deal," the UN Agenda 2030 in disguise. 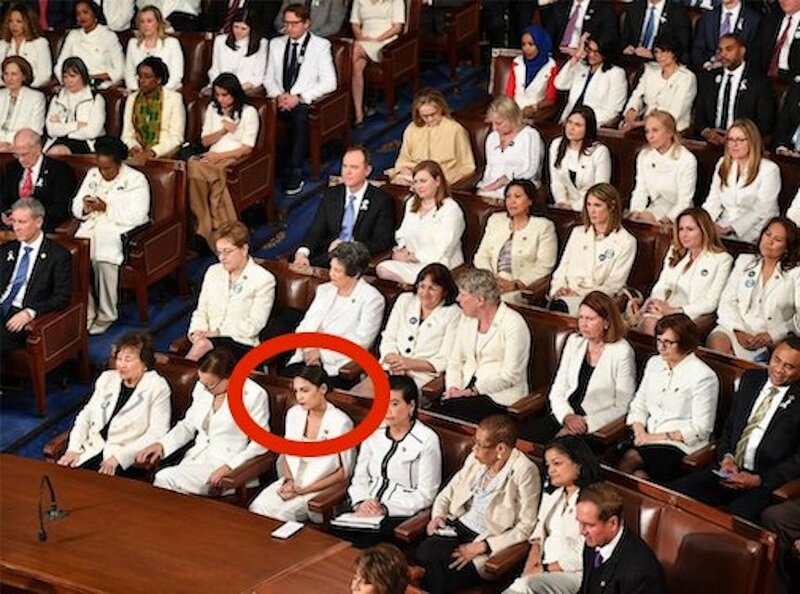 During the State of the Union Address, many new female members of Congress, wearing white clothing (sheep), were told what to do, what to think, and what to support or not support. These new members of Congress dressed in white – they are very dangerous sheep. Alexandria Ocasio-Cortez is a front man for something very devious. We don't take her seriously, but an enormous number of Americans are taking her very seriously. And some very evil organizations are supporting her agenda. The majority of young Americans have been dumbed down regarding American and World History. They’ve been fed lies about socialism and believe it is the answer for their future. Ocasio-Cortez gives long rants against President Trump and she talks of the horrors of Climate Change. She spouts fears of escalating racism, and, of the evils of White Privilege. Ocasio-Cortez followers are brainwashed sheep and include people who want free stuff while they wait to die from Climate Change. They have a deep hatred for Republicans and Conservatives who back Trump or people who do not support agendas on Climate Change. I first became suspicious of Ocasio-Cortez when I saw photos of her with Linda Sarsour. Sarsour is an affiliate of CAIR, a Muslim Brotherhood organization. Ocasio-Cortez promotes the fallacy of white privilege and pushes the idea that race inequality is growing rapidly. At the top of CAIR’s agenda is furthering the racial divide in America. Tweets to their many millions of followers push white privilege and racism daily. And, they push for support for Ocasio-Cortez as their savior. Ocasio-Cortez calls for abolishing ICE and defunding Homeland Security. These are top priorities on CAIR’s agenda. Ocasio-Cortez promotes an agenda that will bring millions of illegal Latinos into the United States, but the problem is, this agenda will also allow millions of others into the US. Will these others be from countries listed as having high terrorist concerns? CAIR National and all of CAIR’s state and local affiliates (there are hundreds) push Ocasio-Cortez’s agenda daily. Netflix has just spent $10 million dollars on a documentary film glorifying Ocasio-Cortez. (5) Never forget, Netflix supported the al-Qaeda group, the White Helmets. Netflix spent millions glorifying an al-Qaeda group and made them out as heroes. (6) The Netflix documentary even won the Oscar for Best Documentary Short at the Academy Awards! And who exactly do you think was behind this push for al-Qaeda being glorified as heroes? Several leading Democrats have supported Ocasio-Cortez's "New Green Deal," including Kamala Harris and Elizabeth Warren. Warren has been a supporter of CAIR in the past and enormous numbers of Muslim Brotherhood in Massachusetts support her. And isn't it interesting that Ocasio-Cortez went to Boston University (BU). The Muslim Brotherhood has an on-campus affilate group at BU. They are extremely politically active. Kamala Harris also has ties to CAIR and recently wrote a letter to them thanking them for their work (see bottom of page). The “Green New Deal,” like the UN Agenda 2030, is a blueprint for globalism and is an overhaul of American life. Lastly, the Organization of Islamic Cooperation (OIC), the second largest inter-governmental organization after the United Nations, with a membership of 57 Islamic countries, has also expressed support for the UN’s Agenda 2030. Many of its member countries who also have a membership at the UN have signed in support of Agenda 2030. As we’ve seen in recent years, Global Jihad is advancing their agenda through the UN, primarily through the OIC. Ocasio-Cortez is a wolf in sheep’s clothing.